Economic Gainer - complex carbohydrates with different glycemic index, high quality protein derived from instanizowanych isolates and whey protein concentrates, containing a large amount of BCAA. Jumbo is large and is also synonymous with unbridled power. The original Jumbo formula was created to help people who have a very fast metabolism and a high demand for a large amount of energy due to physical activity! The highest quality source of nutrients! 318 loyalty points Your cart will total 318 points that can be converted into a voucher of 12,72 PLN. "JUMBO means BIG! JUMBO means strong!" The original JUMBO formula was developed to assist those with very fast metabolism (lean people) and persons who, due to activity levels are extremely high demand for energy. The ratio of the components reflects destiny. Scitec JUMBO PROFESSIONAL changed the ratio of components in favor of protein. In order to provide 55g of high quality protein (more than JUMBO) is enough smaller portion of the product amounting to 162g. This means that the amount of carbohydrate and calorie contents of this formula is less, since their consumption in a greater amount by such persons is required. JUMBO PROFESSIONAL composition was prepared from whey proteins. Proteins are a source of nitrogen and amino acids necessary for the maintenance and development of muscle tissue. - 55 g of high quality protein in 162 gram portion of the! - Improved and increased "Jumbo" matrix containing additional ingredients (12244mg)! - "6-CARB" carbohydrate blend with different molecular weights including carbohydrates from oatmeal, palatinose ™ and Waxy maize! - 6 types of creatine! - In particular, for those with an athletic physique! In addition, the protein contained in the JUMBO PROFESSIONAL help increase and maintain muscle mass. Whey protein derived from milk is considered to be protein "complete", since it provides all of the essential amino acids including the nine essential for the life of amino acids (histidine, isoleucine, leucine, lysine, methionine, phenylalanine, threonine, tryptophan, valine), which the body can not They produce them. The term "efficacy" nutritional protein content of the diet is largely based on an estimate of the extent to which the protein contained in the nitrogen is absorbed and retained by the body, and that is able to compensate for the daily loss of nitrogen. The net protein utilization (NPU) of the percentage of nitrogen that is absorbed by the body, while the biological value (BV) is the percentage of the absorbed nitrogen, which has been 'stuck' in the body. Thus, BV is the product of NPU and digestion. Whey protein is a well digested and is easily digestible amino acids and therefore its biological value (BV) is very high compared to other types of proteins derived from meat, fish, egg or soy. 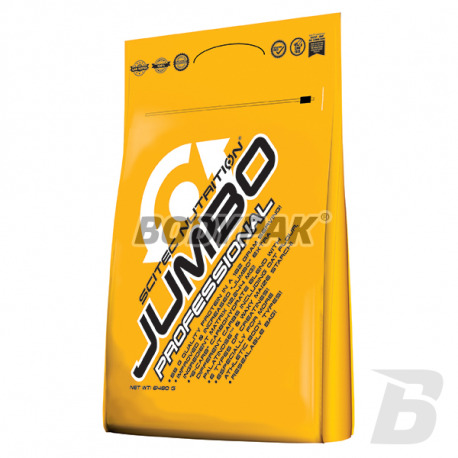 JUMBO PROFESSIONAL contains "6-CARB" carbohydrate blend consisting, among others, oatmeal, palatinose ™ and Waxy maize. Waxy maize is a unique, patented mixture wysokocząsteczkowych carbohydrates, which thanks to a unique manufacturing process have unique molecular profile that differs from the standard sugars (eg. Glucose, fructose) and current products maltodextrin. JUMBO matrix has been enhanced and increased the dose! 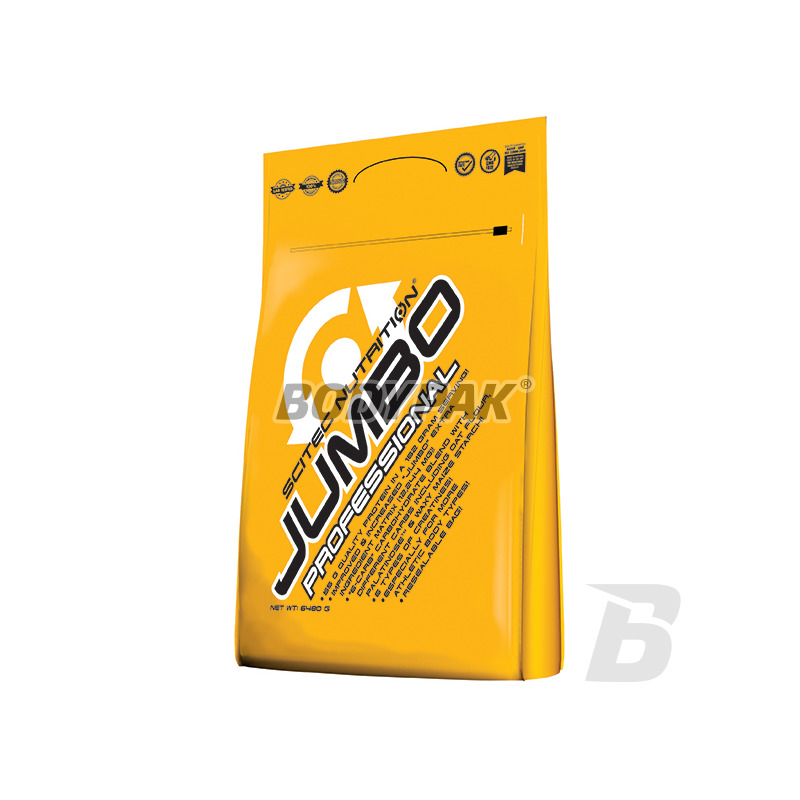 JUMBO PROFESSIONAL Each serving provides 6600 mg proprietary blend of creatine multi "CREA-BOMB" (6 types of creatine). Scientifically it is proven that the consumption of at least 3 grams of creatine per day increases the productivity and effectiveness of brief, yet highly intense workout like. Strength training and aerobic. For JUMBO also we added additional amino acids to supplement those provided with the protein, including the amino acids. Magnesium and vitamin C reduce fatigue and weariness of the body and have a positive impact on energy metabolism. Magnesium addition to the reduction of tiredness and fatigue the body also supports the correct protein synthesis, the proper functioning of the nervous system (neurotransmission and muscle contraction - including the heart muscle), energy metabolism, maintaining acid-base balance, maintaining the good health of bones and teeth, and plays an important role in cell division. Vitamin C has a positive impact on the functioning of the immune system, normal synthesis of collagen in order to maintain cartilage and blood vessels in good condition and protects the body cells against oxidative stress. In addition, the product used Bioperine®, a patented extract of black pepper - effectively improves the speed of absorption of the product. Scitec JUMBO PROFESSIONAL - GAINER SPECIALLY DESIGNED TO MEET YOUR EXPECTATIONS! Ingredients: ultrafiltered whey protein concentrate (derived from milk, instantized involving soy lecithin), oat flour (gluten) maltodextrin, Palatinose ™ (isomaltulose), dextrose, fructose, creatine monohydrate, flavor (raspberry ), acidity regulator (citric acid monohydrate), cornstarch , taurine, L-arginine base, L-glutamine, L-leucine, micronized creatine monohydrate, L-alanine, L-isoleucine and L-valine , magnesium carbonate, beta-alanine, creatine citrate, pigments (carmoisine, Ponceau 4R), thickener (xanthan gum), creatine phosphate, ascorbic acid, KreAlkalyn® creatine monohydrate, L-carnitine tartrate, pyruvate, L-lysine HCl, L -fenyloalanina, L-ornithine HCl, sweeteners (Acesulfam K, sucralose), alpha-ketoglutarate, calcium alpha-lipoic acid, Bioperine® (extract from the fruit of Piper nigrum). CARMOISINE, Ponceau 4R - may have an adverse effect on activity and attention in children. Stosuje od jakiegoś czasu i nie zawiodłem się, że kupiłem duże opakowanie. Smak czekoladowy chyba znudzić się nie może - jest rewelacyjny! High-quality supplement that has been designed for one purpose: to help you build your dream muscle mass! Besides refined composition it is also characterized by great flavor and solubility! Incredible nutrient carbohydrate and protein type gainer designed for intense training athletes whose goal is to increase the weight ciała.Skutecznie and quickly increases the body weight! Just the appropriate dosage to achieve the goal! Superb conditioner weight, wherein the ratio of carbohydrate to protein is 1: 1. The high content of BCAA affects both the inhibition of catabolism and regeneration of powsyiłkowej. A small amount of sugar in each serving is a very big advantage. The manufacturer also took care of the refined taste and smooth solubility.